ProVen Probiotics 50+ A-Z Multivitamin with Acidophilus and Bifidus has been developed to supply tailored nutritional support as we age past 50 years.During this time, it is often necessary to increase intake of vitamins and some minerals in order to maintain optimum health. That is why ProVen 50 Plus contains most of the 13 essential vitamins at above the RDA level. In addition, the aging process is often described as a process of loss of immune balance together with an increased level of free radicals. ProVen 50 Plus contains the extensively studied Lab4 probiotic bacteria to help support immune function as well as an array of antioxidants to help neutralise the negative effects of free radicals on the cellular ageing process. Lactobacillus acidophilu s (CUL-60), Lactobacillus acidophilus (CUL-21), Bifidobacterium bifidum (CUL-20), Bifidobacterium animalis subs p.lactis (CUL-34) - Containing 2.5 billion viable cells. Ascorbic acid, vegetarian capsule shell (hydroxypropyl methylcellulose), ferrous fumarate, nicotinamide, modified corn starch, vitamin e (d-alpha tocopheryl succinate), zinc citrate, ginkgo biloba leaf powder (ginkgo biloba), n-acetyl cysteine, microorganisms (lactobacillus acidophilus, bifidobacterium animalis subsp. Lactis, bifidobacterium bifidum), manganese gluconate, dicalcium phosphate, corn dextrin, calcium pantothenate, olive oil, corn maltodextrin, co-enzyme q10, alpha lipoic acid, sorn starch anti-caking agent (silicon dioxide, magnesium stearate), microcrystalline cellulose, potato maltodextrin, vitamin b6 (pyridoxine hydrochloride), thiamine mononitrate, riboflavin, copper citrate, lutein (targetes erecta), acacia gum, antioxidants (dl-alpha tocopherol, sodium ascorbate, ascorbyl palmitate, natural mixed tocopherols), vitamin a (retinyl acetate), sucrose, zeaxanthin (lycium chinensis), folic acid, chromium picolinate, potassium iodide, sunflower oil, sodium bolybdate, sodium selenite, biotin, vitamin k1, (phylloquinone), vitamin d3 (cholecalciferol), vitamin b12 (cyanocobalamin). As a food supplement take 1 vegicap daily with food. Below are reviews of ProVen Probiotics 50+ A-Z Multivitamin - 30 Capsules by bodykind customers. If you have tried this product we'd love to hear what you think so please leave a review. Great supplement all in one capsule love it. 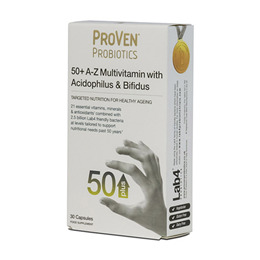 ProVen Probiotics 50+ A-Z Multivitamin with Acidophilus and Bifidus has been developed to supply tailored nutritional support as we age past 50 years. Contains most of the 13 essential vitamins in order to maintain optimal health.